Every ostracized group has some lower group it looks down on. Trekkies look down on Juggalos. Juggalos look down on Furries. Furries and Juggalos both look down on Juggafurs (which, yes, is exactly what it sounds like). And as toy collectors, we look down on "Hot Wheels guys." You know the type. The ones who will sit in the Toys Я Us parking lot waiting for the doors to open, then run to the car aisle and spend half an hour going through every single peg - provided they don't have a contact in the back who will bring out a fresh case for them to pick clean. The ones who make scalpers look decent by comparison (though since they figured out they can sell our chase figures on eBay to get more money for their cars, they've started stripping our aisles, too). The ones who flip out if the cashier doesn't put their purchases in the bag carefully enough, because they might get a crease on their cardboard. Hot Wheels guys are creeps, and they make the rest of us look bad by association. Which is why, when Rustin alerted me to the existence of this piece, I cursed inwardly: because I knew I'd have to hit the car aisle and become one of those guys, if only for a little while. Specialty: Speedy street pickup, with exposed air intake, plus fig passenger notches and spots to hang on. Riders welcome. Can you figure out where? With absolutely no fanfare or promotion, Mattel made a car intended to "play nice" with Lego. It's a sleek red pickup truck with translucent grey windows, a front-end like a muscle car and the familiar Hot Wheels logo on the sides. The logo is pixelated - aka, "blocky," befitting an unofficial Lego truck - and the wheels have oversized yellow rims. A rounded roll bar starts over the doors, and runs all the way around the bed of the truck. 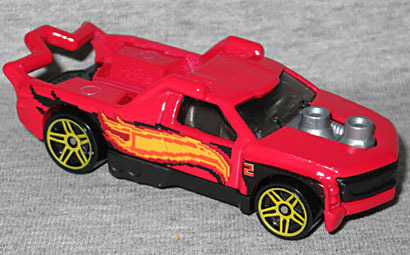 The engine's "exposed air intake" is two raised tubes coming up out of the hood, and there are two matching bumps in the bed of the truck. The bumps are the studs that Legos can attach to (in theory, at least - Mattel doesn't have the same tight tolerances that Lego does, so the fit can be a little loose), and the "roll bar" is sized to be gripped by Lego Minifig hands. There's a hole in the bottom of the truck that a stud can fit into, and a sculpted design beneath the engine that looks like the underside of a 2x4 brick. It's not directly under the air intakes, but it's close enough that you get what they were going for. 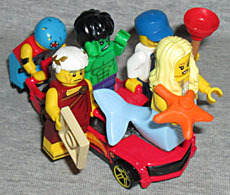 If you're super economical with the space, you could probably get eight minifigs on the car and still have it roll: two on the hood, one in the back, two on the doors, and three crowded on the back. That's if you want to go crazy, though: I find five to be a much more sane number. You could also use the hood as a platform to start building on, giving you room to expand to even more figures! Plus, since every company to ever make block figures has copied Lego's style, you can also use Mega Bloks, Minimates, Kre-O, Best-Lock or any other appropriately sized scrap of plastic. If you're going to be haunting the Hot Wheels aisle in hopes of getting this awesome crossover toy, we wish you luck. There are lots of cool HW cars out there that I'd buy if I ever saw them, but the scalpers get to them first. For this one, look on the right hand side of the card for the orange stripe that identifies it as part of the "HW Stunt" subline, or (like Rustin says), crouch down and look up at the pegs, so you can see the "FIG RIG" name printed at the bottom. Hopefully you won't have to spend too much time around the creeps. Now, if Lego is smart, they're release one of those little polybagged sets that has a sleek red pickup with blue windows and a black base, as well as a small piece of orange track for it to roll on. 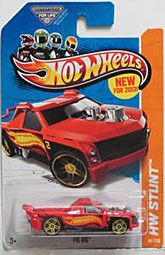 Perhaps another way to get your hands on a Fig Rig is not to be so judgmental about "Hot Wheels guys," ya think? It's a big group of collectors and we're not all door warmers. This is very true. It's those stereotypes that take me out of collecting every few years, but the compulsion comes back. But I'll keep you in mind when I have extras of the more cross-genre cars in hand! This still hard to find? I saw another at my Target so I was just wondering. There's a yellow recolor coming out in an upcoming case, too, should red not fit your aesthetic.